In honor of the new year, Vocational Rehabilitation shares the story of one woman’s resolution to find the perfect job. Watching television can be a great stress reliever after a long day. But how do programs get from production to the audience? That’s where people like Ingrid Cupeiro play a leading role. 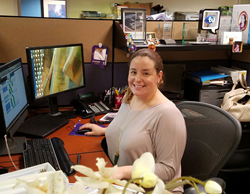 As a member of the programming department at Telemundo Network, Ingrid schedules and coordinates programs, and she loves every minute of it. She also works on strategy, brainstorming how to compete with other networks. When Ingrid isn’t working, she enjoys spending time with her family. Although math was never her favorite subject in school, she does enjoy reading. “Whenever I have the opportunity I will have a book in my hand,” she says.